Caiman free games: Derelict by Erik Hogan. Trapped within a star cruiser, surrounded by hostile creatures, can you and your squad escape the Carnage alive? 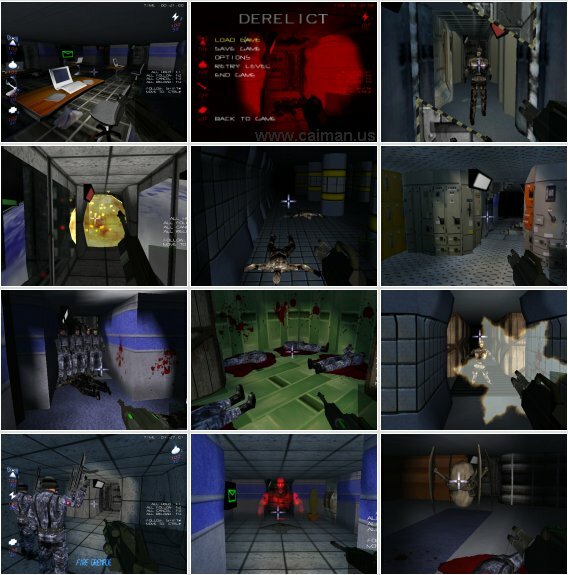 Derelict is a hybrid First Person Shooter and Tactical Action game. You will need to guide your team of battle hardened marines through the Atlas while protecting them from danger. 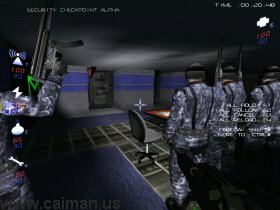 You can do this in two ways: Firstly, controlling the marines directly in a First Person view and secondly, by giving the marines orders via the map view. You will need to use both control schemes throughout the game to be successful. 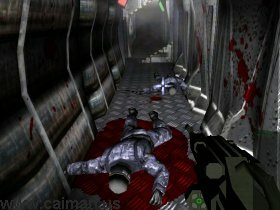 Each marine in your team has his own unique skills and abilities, some of which may be vital to get through certain areas. As you progress through the Atlas you may come across survivors who can take the place of fallen comrades. He possesses a motion sensing radar, which is useful for finding and predicting the attack patterns of incoming enemies. This deadly warrior carries around a Gatlin Cannon that can efficiently mow down hordes of enemies. Excellent at protecting volatile areas. He carries a modified rifle with grenade launcher attached, this has the power to rip apart objects and certain doors, as well as to temporarily disrupt teleportation streams. The Combat Engineer carries automated tools for quickly repairing doors. He is also an adept hacker and can crack security systems faster then anyone else on your team. He is essential for keeping your team healthy. His hazard suit allows him to walk through dangerous areas that would wound or even kill the rest of your team. Hint: To complete a level and to go over to the next level: Bring all your men (that left) together into the storage room (these rooms look always a bit similar to the storage room of the first level).